Last time we talked about the PBC we looked at its declarations concerning the composition and authorship of the Book of Isaiah. This time we shall examine its eight responses on the composition, authorship and Messianic nature of the Book of Psalms, dated May 10, 1910 (can be found in Denzinger 2129). The Psalms are a particularly important book of the Scriptures. They form the heart of the Old Testament and are used in so many places and ways within the Church's liturgy that it is difficult to quantify; I would venture to say that the Book of Psalms is the most used book of Scripture in the liturgy. It is also very important in the New Testament, and Psalm 110 is the most quoted Messianic psalm in the Gospels and Epistles. Like Isaiah, how we interpret Psalms has much to do with how we view the Messiah, because both books have traditionally been seen as books of prophecy that spoke of Christ and His mission. The most famous Messianic psalms are 2 ("Thou shalt break them with a rod of iron; thou shalt dash them in pieces like a potter's vessel"), 22 ("My God my God, why hast Thou forsaken me?") and as mentioned above, 110 ("The LORD said unto my Lord, Sit thou at my right hand, until I make thine enemies thy footstool"). This Messianic interpretation of the Psalms goes back to the Jesus Himself, who quotes from Psalm 110 in His dispute with the Pharisees when discussing the identity of the Christ (Matt. 22:41-46) and Who quotes Psalm 22:1 while dying on the cross. Quotes from the Psalms are frequent throughout the New Testament, not as uplifting, consoling words of wisdom (the way they are often used today), but as inspired prophecies bearing directly on the life and death of the Messiah, Jesus Christ. Thus, it can be said without much exaggeration that prior to the Church's Trinitarian and Christological controversies of the mid-patristic age, much of her Christology was derived from the Psalms. That Christ was co-equal with the Father could be proven from Psalm 110, where the Psalmist (in the person of the Son of David says) "The Lord said to My Lord," indicating that the son is Lord just as is the Father. The same psalm, Psalm 110, is used in Hebrews to explain Christ's eternal priesthood, for in verse 4 of that psalm we run across the famous phrase, "Thou art a priest forever according to the order of Melchizedek." When we look to the Psalms, we are looking to the earliest Christological treatise. It is not surprising, therefore, that this book came under scrutiny from the modernists at the turn of the 20th century. This attack on the Book of Psalms was but one part of a larger attack on the Christological doctrines as a whole and a perfidious attempt to create a "Jesus of History" over and opposed to the "Christ of Faith." Thus, the Pontifical Biblical Commission saw it as a very important matter to settle forever the doubts raised about the Book of Psalms, just as it did with the Book of Isaiah. Responses I and III-V deal with the Davidic authorship of the Psalms. Responses II and VI-VII treat of the date of composition, while response VIII deals with the method of interpreting the Psalms, especially those traditionally held to be of a Messianic character. In response I, we are given to understand that Catholics are not bound to insist that each and every psalm is individually the sole work of King David alone. The Church has never taken this position, but it is good that the PCB acknowledges this first hand, lest the Church be accuse dof biblical "fundamentalism" in looking at questions of authorship. Nevertheless, response II points out that whether or not David composed each Psalm, the entire Psalter is undoubtedly of a very ancient Jewish tradition, "more ancient than the Septuagint," as evidenced from the uniformity of the titles of many of the Psalms in the Hebrew and Alexandrine texts. This would commit Catholics to acknowledging and affirming that even the psalms that may not have been written by David were certainly composed prior to the 2nd century BC and possibly as early at the late 4th century BC. This is a far stretch from the time of David (11th century BC), but it is much earlier than some modernists liked to suppose (some asserted that the Psalms were not even completed until around 150 AD!). Response III is probably the most important in dealing with authorship, because it lays down a general principle. The question posed is, "Can the aforesaid titles of the psalms, witnesses of Jewish tradition, be prudently called into doubt when there is no serious reason against their being genuine?" To this question, the Commission responds, "In the negative." What this boils down to is this: we have a lot of Traditions that come down to us regarding the authorship of certain books of the Bible: Moses writing the Pentateuch, Jeremiah and Isaiah writing the books attributed to them, the Evangelists writing the Gospels, and so on. Since we are so far removed from them in time, our confidence that these people in fact wrote these books is largely based on Tradition. Now, unless there are substantial and credible reasons to question that Tradition, then it is therefore imprudent to dispute it. Those who deny the traditional authorships place the burden of proof on themselves. So, it is up to the modernist to prove that Moses did not write the Pentateuch, or that David did not write the Psalms. All things being equal, if there is no evidence to the contrary, the Traditional authors are to be maintained. Therefore, the appropriate response to, "John didn't write the Fourth Gospel" ought to be, "Oh yeah? Prove that he didn't." So, next time somebody tries to tell you that Psalm 2 reflects the eschatological-Messianic expectations of the post-Exilic Jewish community under Greek persecution, you can tell them that they have incurred latae sententiae excommunication according to the motu proprio Praestantia Scriptura of St. Pius X of 1907, reserved to the Roman Pontiff alone. Or just politely refer them to this post instead. Response VI reasonably points out that it is not contray to faith to admit that some of the psalms have been modified of added to in order to make them suitable for liturgical use in the Jerusalem Temple, and furthermore that this does not detract from its inspiration. In the New Testament, we have of course done this with the Lord's Prayer by adding the doxology to the end for use in the Mass. Nothing new here. Response VII deals with the date of composition and builds on response II. While the second response commits us to dating the Book of Psalms earlier than the Septuagint (c. 150 BC), response VII commits us to holding a date prior to Ezra and Nehemiah (prior t0 444 BC, thedate of the arrival of Nehemiah in Jerusalem). This tells us that we must date the Psalms, even the non-Davidic ones, to either the time of the Exile or before (prior to 587 BC). 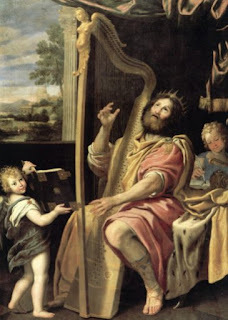 Therefore, all the Psalms are asserted to have been composed in the Kingdom period, mostly by David, but some by scribes attached to the Temple (like the scribe Asaph, who is known to have composed Psalms 50, 73, 79 and 82). Finally, response VIII affirms the traditional understanding of the Book of Psalms as not only a liturgical but a prophetic text and stated that "it is necessary to admit a number of prophetic and Messianic psalms, which foretold the future Savior's coming, kingdom, preisthood, passion, death, and resurrection." Of the idea, common among Jews even to this day and among the ilk of the Jesus Seminar, that the prophecies of the Messiah in the Psalms refer only to the nation of Israel collectively and pertain only to the future lot of the Jews, the PBC says that "it is necessary to reject altogether." By preserving the Psalms, we preserve their Messianic character, and in doing so we preserve and strengthen the very foundation of our Christology. When we argue Christology, we can argue from Nicea and Chalcedon. But what do you think the Fathers at Nicea were arguing from? They argued from the Psalms, Isaiah and the Gospel of John, three of the most vilified and attacked books of the modernists. Next time we will look at the PBC's statments on the Fourth Gospel.